Our customers know to rely on our all-around expertise with Wolf appliances, especially when it comes to repair and maintenance. So you can bet, when they ask how to clean their Wolf oven or range, we have as much to offer about their Wolf appliances’ exteriors as we do about its inner workings. Here are a few tips you can use to keep your Wolf oven or range looking as fresh-out-of-the-box as the day it was installed. The best way to keep your range or cooktop in pristine condition is to make a habit to clean it daily, ideally after every use to prevent buildup of grease and food debris. Use a lint-free or microfiber cloth (an abrasive cleaning surface risks damaging the finish). Lemon Pledge – Yes, it’s not just for furniture! Lemon Pledge does as good a job of cleaning and shining stainless steel surfaces as pricier options, with the added benefit of freshening up the kitchen after especially odiferous meals. Degreaser – If you’ve just prepared a dish that splattered grease everywhere, you’ll want to precede the Pledge (or other polisher) with a good degreasing cleaner like Formula 409or Fantastik. Signature Polish – Sub-Zero and Wolf recommends Signature Polish as a stainless steel cleaner and polish. You can order it here. Stainless Steel Cleaner and Polishes – If you don’t feel like calling in to order Signature Polish, there are plenty of stainless cleaners / polishes available online or at home improvement outlets, such as those by 3M or Weiman. Apply degreaser first (if needed), let sit to break down grease, then wipe clean. Make sure you don’t spray any cleaning product or liquid directly onto the electronics or display head as this could damage the delicate controls. Always apply cleaner and polish in the same direction as the grain to avoid scratching or marring the finish. Be sure to look for the grain on knobs and handles as well. Note: Never place aluminum foil on the bottom of your oven to catch spills. The foil disrupts the oven’s air flow and heat pattern, resulting in uneven cooking. Cleanup is so easy with the tips below that foil is completely unnecessary. If a spill should happen in your oven, you’ll want to remove it as soon as the oven cools completely, especially if the spill is from sugar- or acid-containing foods such as tomatoes, fruit juices, or milk which can permanently dull the oven surface. Letting the oven cool completely not only protects you, it will protect the appliance, as applying cold water or cleaner can cause hairline cracks in the enamel. 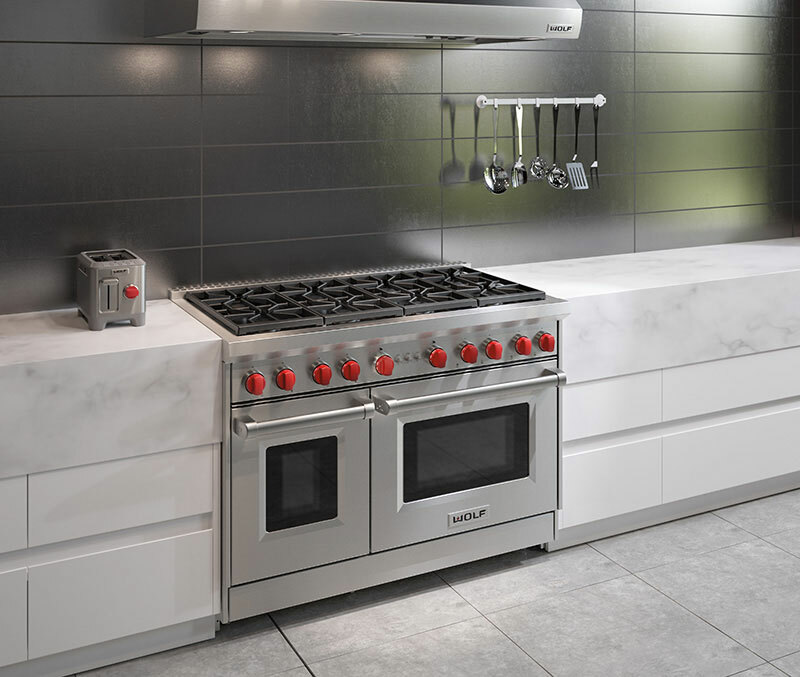 For Porcelain Interiors – Never use chemicals or cleaners to clean porcelain oven interiors, because they can ruin the porous porcelain surface. Use a mild detergent such as Ivory or Joy in warm water, and sponge up the spill using a mild abrasive like Soft Scrub or Bar Keeper’s Friend. For Stainless Steel Interiors – To clean your stainless oven interior, use a lint-free or microfiber cloth and a stainless steel cleaner to remove any food stains (see above for stainless steel cleaner options). Then apply a stainless steel polish to maintain luster and protect the surface from future food stains. Always apply cleaner and polish in the same direction as the grain. Use a razor blade to gently lift baked-on foods from the oven cavity and window. For stubborn stains, spray with a mild abrasive cleaner or spray degreaser and scrub with a no-scratch pink or blue Scotch-Brite pad. After the oven completes its cleaning cycle and has cooled to room temperature, you can wipe up any residual ash with a damp cloth. Before using any cleaning product, it’s a good idea to test the product on a small, out-of-the-way spot to make sure there is no reaction with the stainless steel. This is unlikely with name-brand products, but your Wolf appliance is an investment you don’t want to take a chance with. If you have further questions, feel free to call us at (888) 782-9653, or consult either the Wolf Use & Care Guide or the specific Use & Care manual that came with your model. If you found another issue while cleaning your Wolf appliance – perhaps the oven light has burned out, a burner isn’t igniting, or there’s an issue with the computer console – and you are in our Southern California or Northern California service areas, don’t hesitate to reach out to Box Appliance to schedule Wolf repair. Own a Sub-Zero refrigerator as well? Check out our blog for recommended Sub-Zero cleaners and polish.